Theatre seems to have emerged in Central Asia in the 4th century BC, and was known as Maskara, in which performers wore masks. Puppet performances are recorded from the 1st century AD and were hugely popular. When Islam conquered the region, puppet performances were banned. Happily, in the 9th century, the enlightened Samanid rulers promoted the arts, literature and science. Bukhara became the empire's capital and it rivalled Baghdad in its glory. 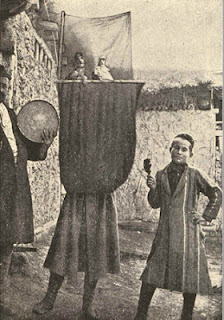 The Samanids revived many ancient traditions, including the puppet theatre. It is said that one ruler insisted that after Friday prayers a puppet performance should be staged in Bukhara's Registan (main square). At the beginning of the 20th century all artists, musicians and puppeteers lived in the same neighbourhood of Bukhara. Puppeteers handed down their skills and secrets to their sons, who in turn added their own improvisations to the stories. Famous characters such as Khodja Nasruddin, remembered for his funny stories and anecdotes, were often included in the plays. And politics of the day were also made fun of. In Soviet times theatres received government support. However, by the 1950s, funding declined for puppet shows and they had almost disappeared, possibly because they could be so subversive! Post-USSR there has been a significant revival in Central Asian puppetry. Kazakhstan today has nine large puppet theatres, some of which are private. Uzbekistan has ten, all state-owned. Kyrgyzstan and Tajikistan both have two state-run puppet theatres. Bukhara is an excellent place to visit the workshops of puppet makers: Iskandar Khakimov's atelier is located at 2 Centralnaya St., on the south side of the Lyabi Hauz. He explains each step of how he makes his gorgeous puppets, from the papier-mâché heads beautifully painted in oils to the hand-stitched traditional costumes. It is also possible to watch an early evening puppet show in English at the 16th century Kukeldash madrassah, on the north side of Lyabi Haus. 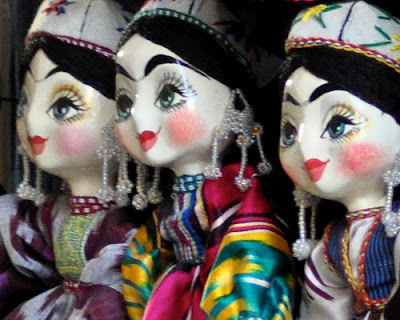 It is delightful: the story of an Uzbek wedding, combining music, dance and puppetry. There is a sign board outside the madrassah - ask your guide to phone +998 936 512 933 to book tickets. (If there are no advance bookings the show is cancelled). Cost is around US$8. It usually starts at 6:00 p.m. and runs for 45 minutes. Charming. On an Uzbek Journeys tour you will have the chance to visit Mr. Khakimov's workshop in Bukhara as well as the Koryazov family of puppet makers in Khiva. 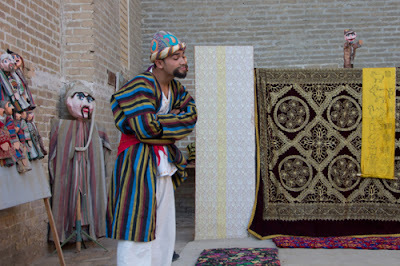 And why not enjoy the puppet show one evening in Bukhara?